It is a hot August day in Alushta, a popular beach resort on the scenic Crimean coast set against a magnificent backdrop of green and rugged mountains climbing to 5,000 feet. Tens of thousands of vacationers from across the former Soviet Union are strolling along the town's tightly packed Naberejnaya (seaside promenade) in minimal states of dress, plunking down on blankets on adjacent pebbly beaches and swimming in the clear and limpid waters of the Black Sea. As an "affectionado" of beach towns from Hawaii to the Cote D'Azur, I am struck by how lively and colorful the scene in Alushta is compared to resort towns in the West. Certainly there is a whole lot of selling going on out on the Naberejnaya, where one finds a seemingly endless line of vendors manning small stands that sell a cornucopia of products and services to beachgoers at what, for Westerners at least, are rock-bottom prices. Here are sellers of cold beer and home-made wines; impossibly delicious watermelons selling for six Ukrainian hryvnya (about $1.20); grapes; peaches; eggplants; garlic and sweet onions; roasted corn on the cob; dried fish hanging on poles and spicy; piping hot Georgian meat; and cheese-filled pastries with exotic names like chiburekee and hatchipuri. Nearby, representatives of competing local tour companies hold aloft colorful signboards spelling out their travel offerings for the week and attempt to out-shout each other in enticing tourists to sign up for tours of caves, waterfalls and ancient fortresses scattered around the rugged Crimean peninsula. Rickshaw drivers on bicycles weave precariously in and out of pedestrian traffic as they urge walkers to take a load off their feet and take a ride down the Naberejnaya. Other sharp-eyed capitalists have come to the waterfront with a storehouse of lavish costumes and exotic animals, calling out to passersby to pose as Marie Antoinette or Rasputin, or with a monkey or falcon perched on their shoulder. Overall, the Alushta waterfront is a festive "anything goes" sort of scene with an over-the-top, almost Felliniesque, quality. It is tacky as hell to be sure, but tacky in an ingenuous, life-enhancing way they would never be able to replicate in places like Fort Lauderdale or Santa Monica. Speaking of which, it seems more than a little surprising that the American travel industry has yet to discover Crimea, a triangular, Maryland-sized peninsula suspended like a pendant from Ukraine 's southern coast far out into the Black Sea that must surely rank as one of the most exquisite and affordable vacation destinations on Earth. Crimea's overpoweringly beautiful landscape, with majestic vistas of mountains plunging into the sea, comes together with an overabundance of ruined cities and castles, fin de siecle palaces from the last days of Imperial Russia, as well as modern resort towns like Alushta. The mountains of southern Crimea are a naturalist's paradise — a wild-west landscape filled with great stone monoliths, hidden waterfalls and spectacular caves. Further north the mountains give way to broad steppes, and rocky beaches segue into sandy ones. The flora and fauna of Crimea are Mediterranean-like, yet with enough rain to keep the landscape translucently green year around. Crimea is the place where Russia first encountered the Islamic world when Catherine the Great captured the place from the Ottoman Turks, some 225 years ago. Today this region, upon which Pushkin, Chekhov and Tolstoy lavished some of their most sublime poetry and prose, remains a scintillating blend of Europe and Asia with a mixed population of Orthodox Christian Slavs and Muslim Tatars, and with a myriad of archeological and architectural treasures. Ukraine's capital city of Kiev, some 500 miles north of Alushta, has gotten some ink in the U.S. media in the two years since the country's pro-democratic "Orange Revolution" as a hip undiscovered "new Prague," and a growing number of American Jews have been taking heritage tours to shtetls in western and central Ukraine their ancestors inhabited a century or more ago. Yet Americans and western Europeans are few and far between in Crimea, once known as the "Soviet Riviera" and today Ukraine 's main tourist mecca. Crimea is packed with visitors during the peak season, but nearly all of them from the "FSU" or nearby East European countries. Indeed, during a weeklong visit to Crimea last August, my fiancé Tatyana, her teenage daughter Hannah and I managed to go through our vacation without overhearing another person speaking English. It is perhaps unsurprising that Americans have not yet begun showing up in Crimea in significant numbers because the tourism infrastructure still has some distance to go in terms of dropping old Soviet habits and adapting to reach western standards. 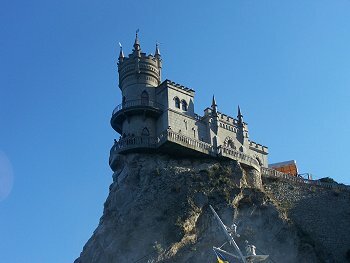 While several luxury hotels have been built in resorts like Yalta and Alushta in the past several years, with sky-high prices to boot, many other hotels with quite decent accommodations do not accept credit cards and insist that visitors pay their entire bill up front in hryvnya (pronounced grivnye). In addition, there are very few car rental companies in Crimea. This lamentable situation means that visitors who wish to reach sites of interest in scattered and often remote locations around the peninsula must either seek out and hire a driver with a car and negotiate a price per day for his services, or accept being crammed onto tour buses and mini-vans and put up with guides who rarely speak English and tend to put tour group members through their paces in much the way that drill sergeants treat military recruits. For all of that, Crimea is developing apace and western style conveniences are arriving rapidly, if only to service the "New Russians" — the nouveau riche of Moscow who have traveled the world and are now demanding the same level of services at home that they find in Spain or France. In the meantime, Crimea remains a place for the adventurous; people willing to put up with a certain level of inconvenience and discomfort in order to experience one of the world's most vibrantly beautiful locations before it is transformed into a more standardized, but less interesting, place. Crimea has a fascinating history that begins with colonization by the ancient Greeks (Cape Meganom, in eastern Crimea is traditionally believed to be the spot where Odysseus found an entrance to the Underworld of Hades in Greek mythology). Then came conquest by the Scythians, Byzantines, Cimmerians, Khazars (a mysterious Turkic people of the southern Russian steppes whose monarchs converted to Judaism around 800 A.D.), Venetians, Genoese, Mongols, Crimean Tatars and Ottoman Turks who, as noted, were expelled by the armies of the lascivious but geopolitically adept Catherine the Great. 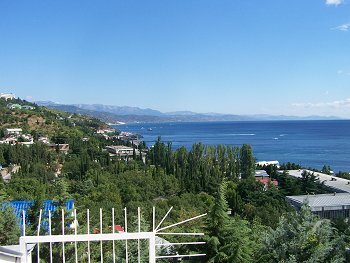 According to local lore, one of the mountains above Alushta is said to resemble Catherine lying on her stomach gazing hungrily across the Black Sea in anticipation of never-realized conquests in Turkey. Crimea's history impacts its present-day composition of some 2.5 million Russians, Ukrainians, Crimean Tatars (a Muslim people who were expelled to Central Asia by Stalin during World War II, but who have now largely returned), Pontic Greeks, Armenians and Crimean Kairites, a nearly extinct Turkic people descended from the Khazars who practice a religion that venerates the Torah, but rejects the oral tradition of rabbinical Judaism. With the recent ascension to power in the Ukrainian government by pro-Russian prime Viktor Yanukovych, the expectation on the street in Alushta is that the new Russian millionaires from Moscow will start investing in Crimea 's infrastructure in a big way. Indeed, the Orange Revolution with its pro-western and anti-Russian sentiments, never had much impact in Crimea where ethnic Russians considerably outnumber Ukrainians. A wild card, however, are the Crimean Tatars — estimated at about 15 percent of the population — who are widely resented by the Slavic population for ongoing efforts to reclaim lost lands, and who seem, in general, to be moving in a more Islamic direction (Tatar women wearing head scarves can be seen selling melons and trinkets to bikini-clad tourists on the Alushta waterfront). Alushta is hardly the most renowned of Crimea's beach resorts. That honor falls to Yalta, which lies thirty miles down the rugged coastline to the east. Yalta remains the crème de la crème of Crimea, a faded dowager from the gilded age of Chekhov (a statue of his famous literary figure A Lady With A Dog occupies the place of honor on the Yalta Naberejnaya), that is presently shaking off generations of Soviet lethargy and preparing for its second coming with an influx of flashy luxury apartment buildings. Yet Alushta, a less sedate town that is presently celebrating its 100th anniversary, is where the action is in Crimea, a place where middle-class Russians and Ukrainians of all ages come for a rollicking good time. Alushta is a relatively small place with a permanent population of about 35,000 (at least five times that number cram into town during the high season of July and August) but it offers great differences in terms of ambiance. The beachfront is wild, crazy and open all night, both along the laid back Naberejnaya, where couples stroll at all hours and night swimming is a pleasure, and the less appealing downtown entertainment zone, which during July and August is a raucous party scene with a frenetic combination of discos and carnival rides. Yet only a few blocks up from the beachfront, at the other end of a charming hillside park filled with cypress trees and southern pines, the city is eerily quiet on warm summer nights under a canopy of bright stars. Astride another hilltop is the old section of town, one finds a rabbit's warren of distinctive Russian-style wooden houses, an ornate Orthodox Church and a recently restored centuries-old mosque with a soaring gilded minaret. Alushta means "Place of Winds" in ancient Greek, and because it sits in a bowl-like valley with the wind whipping down from a mountain pass about seven miles away, the town has a slightly cooler, decidedly less humid climate than Yalta, which is so closely hemmed in by mountains that it can be stifling during the summer heat. Alushta also has the advantage of being at the center point of the Crimean coast; with Yalta, Livadia Palace (site of the 1945 conference featuring Roosevelt, Stalin and Churchill), the kitschy Swallow's Nest castle, the soaring I-Petri mountain and the port city of Sevastopol within an hour to two hour's drive to the west; and the awe inspiring Valley of the Ghosts with its rock monoliths, the exquisite cliff-dominated Novy Svet coastline and the great Genoese hilltop castle of Sudak, a similar distance to the east. Alushta is also less than an hour's drive from Simferopol, the gateway to Crimea for travelers arriving by train and plane, and only 90 minutes from the ancient mountaintop cave city of Chufut Kale (or Jews' Fortress), a mysterious, now abandoned, place settled nearly 2,000 years ago that long served as the spiritual center of the Kairites. The principle pleasure of Alushta is, of course, the sea, and the Black Sea is divine on a hot summer day — unexpectedly clear, calm and deliciously cool. A visitor has a choice of swimming at the beach attached to his or her hotel or sanatorium, or paying a fee of about a dollar to swim at one of a number of public beaches. Like the Mediterranean, the limpid Black Sea is a swimmer's — not a wave rider's — sea. On most beaches there is no discernable effort by lifeguards to keep swimmers close to the shore (often there are no lifeguards at all), and visitors can swim far enough out to sea to float on their backs and enjoy the wide panorama of the Alushta waterfront and green mountains soaring high above the town. For the more adventurous there are diversions like parasailing over the water for about $40. Tour boats leave hourly from the principal piers of Alushta for excursions up and down the coast, including a mellow eight hour round trip sail to Yalta and the Swallow's Nest castle for about $15 a person. Alushta has never been known for world class dining, but during the last year or two, some upscale restaurants have sprung up to serve the "new Russian" clientele. One is the Dorado Fish Restaurant (at the far western end of the Nabarejnya), which is attached to the sleek new More (Sea) resort. Diners on a third floor outdoor terrace overlooking the sea are treated to linen table cloths, impeccable service and an extensive list of Crimean and Georgian wines. Tanya and I had a local Sauvignon, which was a little sweet but delicious, while listening to a local crooner giving a mannered performance of Tony Bennett songs. Despite all the flourishes, prices are quite reasonable. I had an excellent veal in asparagus dish for 70 grivny (about $13) while Tanya had a superb salmon for 60 grivny ($12). The most charming restaurant in Alushta is Valdelai (Aquarius), an oh-so-mellow New-Agey sort of eatery located at the eastern end of the Naberejnaya, which offers alfresco dining on three terraces and overhanging balconies amidst abundant trees and semi-tropical flowering bushes overlooking the sea. The thick foliage so muffles sound that, even on evenings when a rock band is performing on one end of the outdoor restaurant, diners at the other end can savor their food and sip their drinks in complete tranquility. Valdelai offers a wide assortment of wonderfully cooked dishes for prices that are also to savor (I had a succulent lamb shashlik and fried potatoes for $6). Still, the restaurant's trademark crème de la crème (literally) are its desserts, especially an ice cream concoction called the Egoist, which is composed of several flavors of ice cream, chocolate waffles, noisettes, and Sheridan 's liqueur. Equally delicious is the Coco Paradise, with ice cream, Malibu liqueur, cream and banana. Until recently, it was difficult to find hotels in Alushta up to western standards, but that has begun to change. The most resplendent addition to the city's waterfront is the Crimean Riviera, a meticulously appointed hostelry with a first rate if slightly stuffy restaurant and bar and a huge swimming pool set amidst tropical vegetation fronting on the beach. Still, the price tag ($253 a night during the high season, $195 off-season, suites $477 in high season), might give pause to some visitors, especially since the Crimean Riviera is so close to the downtown entertainment zone that the throb of all-night revelry penetrates the more dignified ambiance the Crimean Riviera seeks to maintain. An alternative hotel that is cheaper and quieter is the Crimean Stars Boarding House, set alongside the Naberejnaya and offering among its diverse services a special medical program offered inside what is referred to as a "hydrochloric cave." High season prices there range from $98 to $123 for a double and $142 to $180 for a suite. The Aquapark, which is part of an entertainment complex that includes one of the few water parks in the former Soviet Union, has double rooms from $128 to $139 and suites from $152 to $180, but unless you are looking for an atmosphere stressing squeaky clean family fun, this may not be the place for you. More upscale and secluded is the just-completed More (Sea), a gleaming collection of stucco vacation villas, each with a large swimming pool and tennis courts (both rarities at Russian resorts) and a faux gazebo calculated to evoke the 19th century world of Pushkin and Lermontov. At the More, double rooms range from $152 to $208 during the high season and suites start at $380. An alternative form of hostelry is a venerable institution known as the sanatorium — places that during the Soviet era rewarded loyal workers and government apparatchiks from Moscow, Leningrad and elsewhere with free-of-charge vacations on the Crimean coast including three meals a day, entertainment and medical treatment. Most of the sanatoriums in Alushta, which are mainly located on a scenic, secluded, and beautifully landscaped hilltop known as Professors Nook, still function in the old way, except that guests now have to pay a portion of the cost of their stay. Many sanatoriums now open their doors to foreigners, who pay a considerably higher, but still relatively modest, bill of fare. Tatyana, Hannah and I were fortunate enough to find space at the Dubna sanatorium, which serves as a vacation home for scientists and technicians from Dubna, a small town near Moscow that is home to the once-super-secret Joint Institute for Nuclear Research. At night it is possible to pick out the Dubna atop Professors Nook from miles around because of a neon nuclear symbol emblazoned on its roof. Yet other than that garish accoutrement, the complex is quiet and dignified, with a gorgeous view of the sweep of the coastline and a winding path leading from the hotel down to the beachfront passing through charming gardens filled with cypress and acacia trees. Staying at the Dubna is like placing oneself in a time capsule straight back to the Soviet era, with a paternalistic management fussily trying to ensure that everyone sits in the same place each day in the dining hall, and offering "folkloric" musical programs filled with balalaikas and ballads. Still, the "old regime" style feels somehow comforting and nostalgically egalitarian; especially in comparison to the "serve the rich and screw the rest" ethic clearly taking over in resorts like Alushta. Meals at the Dubna are nourishing and tasty without being exciting, but certainly no one will go hungry here. The best part of the package is the cost — only $48 a day per person for foreign guests, including three meals a day. Incredibly, spa treatments and medical and dental services by in-house doctors and dentists are also included in the price. An American travel agent can make your reservation, but the Dubna does not take credit cards, so you will have to pay the whole cost of your stay in grivnye upon arrival. There is so much to do and see in Crimea that any visitor who is here for less than a month will have to make hard choices. For those who love nature, trekking in the rugged backcountry is strongly recommended. Just up the mountain from the semi-tropical languor of Alushta is the Valley of the Ghosts, a surreal badlands landscape of giant stone pillars that look like they might have been dropped from the sky by alien visitors, but were in fact sculpted by wind erosion. The Valley of the Ghosts and Mount Demerdzhi, which towers above it, can be toured on horseback as well as on foot. 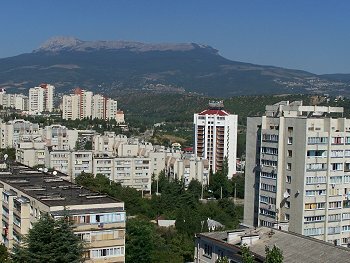 From atop nearby Demerdzhi, whose Tatar name means "Blacksmith's mountain," a reference to the deep red hue it takes during the afternoon hours, there is a sublime view over rock-strewn mountainsides, verdant vineyards sloping down to Alushta far below and a grand sweep of the Black Sea coast beyond. Another nearby nature hike is to the Dzhur-Dzhur waterfall set in a lush, thickly forested glade in a gorge cut into the stark, arid-looking mountainside. Visitors, who are hot and sweaty from the exertion of a 45-minute climb to the falls, can cool off instantly by plunge into one of several frigid pools fed by natural springs, with water temperatures just above freezing. Also not far away is the Marble Cave, which was discovered in 1987, and has several expansive underground halls with stalactites and stalagmites of fantastic shapes, resembling mammoths and dragon heads. Ninety minutes or so further afield is Bakhchisarai, a medieval town filled with mosques and brightly colored houses, set at the edge of a canyon in the center of Crimea, near where the southern mountains rise majestically from the northern steppes. Bakhchiserai was the capital of the Crimean Tatar khanate during the 16th century and retains a strongly Middle Eastern flavor, with Tatar men sitting in outdoor cafes smoking hookahs and playing sheshbesh. The centerpiece of the town is the Khan's Palace, a sprawling series of halls and courtyards with intricately designed wooden ceilings, ornate Arabic inscriptions and exquisite marble fountains. The windows of the rooms where the women of the harem once lived are covered with grilled latticework that allowed the women to look out without being seen. In the corner of a reception hall is a small white fountain known as the Fountain of Tears, built by an 18th century Tatar khan to express his grief over the loss of a Polish princess he loved who was murdered by a jealous lady of the harem. The great Russian poet, Alexander Pushkin, placed two roses in the fountain when he visited here in 1820 and wrote Fountain of Bakhchisarai, a poem that is a still a part of the repertoire of every Russian school child. Two roses are still placed in the fountain every morning; evoking an eye that constantly sheds tears. Up a steep footpath into the hills that tower over Bakhchisarai is the Uspensky Monastery, a gold-domed church build into a sheer cliffside that was originally founded by Byzantine monks in the late 7th century and newly restored since the collapse of Communism. Today the monastery is a place of pilgrimage for Orthodox Christians, with bearded Russian priests in long cassocks asking visitors for alms and babuskhkas (grandmothers) in head scarves and bright costumes gossiping beside a spring said to contain holy water. A bracing climb of about an hour beyond the monastery brings the visitor to Chufut-Kale, a ruined city of cave dwellings located on a windswept mountaintop plateau with dizzying views in all directions. Chufut-Kale is believed to have been founded by the Goths and Alans under the guidance of the Byzantines around the 6th century A.D. and several hundred years later to have fallen under the rule of the Khazars, whose kings converted to Judaism in the 8th and 9th centuries and whose empire, which stretched from the Caspian Sea to Ukraine, included Crimea. A nearby equally mysterious cave-city known as Mangup-Kale is known to have been captured by the Khazars. Chufut-Kale, which has Jewish inscriptions dating back to 1203, was ruled for several centuries by the Crimean Tatars, but they abandoned the city for Bakhchisarai in the 17th century and thereafter Chufut-Kale was occupied mainly by the Kairites, a Turkic people who have preserved a proto-Judaic identity. For this reason, the city became known in the Tatar tongue as Chufut Kale (Jews' Fortress). Passing through a stone gate in the thick walls surrounding the lost city, the visitor finds a vast network of once inhabited caves and ruined Kairite temples (the Kairite word for "temple," kenassa, is from the same Hebrew root as bet knesset or synagogue), several of which contain mysterious inscriptions in Hebrew lettering, but in the Kairite tongue. One such inscription, which can be seen in a kenassa with a tiled roof, records the visit of Czar Alexander III in 1886. There is a "time out of mind" quality to this stark and lonely place where one feels a direct link to the legendary Khazars, who still retain a ghostly connection to the modern world through their fast vanishing descendants, the Crimean Kairites. There are only about 800 Crimean Kairites remaining today (there are also small Kairite communities in Israel, Lithuania and elsewhere), and their numbers are steadily shrinking due to assimilation and intermarriage. Most Crimean Kairites now live in the city of Yevpatoria, two and a half hours northwest of Alushta, across the steppes that cover the northern two thirds of the peninsula. In this shabby but vibrant 2,500-year-old seaside town, originally founded as a Greek colony, and today a stew of ethnic and religious groups, it is possible to visit a centuries' old Kairite kenassa and speak to bearded community elders wearing Turkish fezzes. The elders explain that they adhere to the strict letter of the law as written in the Torah, but reject any additions after the time of the Prophets. The Kairites proudly display Torah scrolls, recite the Shma on Yom Kippur and wish each other Shabbat Shalom. Yet they stress they are ethnic Turks and have no relationship with modern-day Judaism or Israel . They also have less than friendly relations with local Jews, who accuse them of having collaborated with the Nazis during the German occupation of World War II, a charge the Kairites heatedly deny. Adjoining the kenassa is an historical museum, graveyard with stones covered with inscriptions in Hebrew lettering and a restaurant serving Kairite cuisine. Two hours east of Alushta along the majestic coastline is an area known as Novy Svet, a collection of magical bays and soaring rock outcroppings. Close by is the spectacular fortress of Sudak, a huge medieval fortress built atop a seaside cliff with thick walls and 14 square towers. The Sudak castle was constructed by the Genoese, whose seafaring Italian city-state colonized the Crimean coast during the 14th and 15th centuries. This was one of the terminal points of the Silk Road linking China with Europe, a place said to have been visited by Marco Polo's father and uncle on their first trip to China . From the fortress walls, there is a dizzying drop to the beachfront below. In recent summers, there have been medieval festivals at Sudak complete with jousting tournaments. The places recommended in this article only scratch the surface of all there is to see and experience in Crimea . Here is betting that the first-time visitor will follow the lead of Pushkin, Chekhov and Catherine the Great, and return many times to this magical peninsula; a sublime mélange of mountains and sea, East and West, legend and half-forgotten history.